(CNS): The Cayman Islands premier has stated that the implementation of one man, one vote and single member constituencies is not a current priority, which is why it has not featured in government’s legislative agenda for this year. 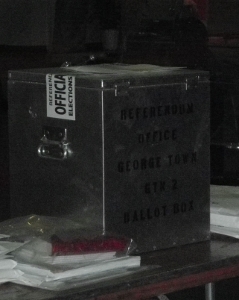 Even though all of the government members, including those elected on the Coalition for Cayman ticket, campaigned on changing the local voting system, it will not be happening anytime soon. Alden McLaughlin said Wednesday that government has other priorities and no timeline has been established for when it will be bringing the necessary legislation to parliament. The premier said the top priorities were getting people back to work, the local economy and stabilizing the country. The premier has been repeatedly accused of not fully supporting the concept of single member constituencies, although many of his party members and C4C government colleagues have all been staunch advocates. However, McLaughlin has denied any lack of support for the voting system and has repeatedly stated he supports both one man, one vote and single member constituencies. Nevertheless, the premier made it clear that his government would not be dealing with it in the near future and there was no timeframe for when the legislation would come before the Legislative Assembly. The premier will have to discuss the issue in the LA shortly, however, as Arden Mclean, the independent member for East end has filed a private members motion in the Legisaltive Assembly seconded by Ezzard Miller asking the government to make the necessary and relatively small amendments to the elections law within the nexxt three months. This would enable the Elections Office to begin its work in making the new constituencies a reality and embarking on the education campaign for voters. Miller told CNS recently that if government does not make the amendments to the election law before the end of this financial year he was prepared to go to the expense, if necessary, of having the legislation drawn up and presenting a private members bill to the House. It does not have to be a priority in 2014 I feel the issue may be getting enough representatives to agree on the version of OMOV. That is, simply one person one vote or combining that with single member constituencies. Whatever the change it would be good for it t happen early in 2015 so we a all get used to it well in advance of the next election. The main benefit of OMOV is that it will prevent those with pure hearts whose hands are clean, from ever again completely dominating and vidictively ruling Cayman as their private fiefdom. Go for it PPM we have a lot to lose without it. There are no sudden changes in PPM. OMOV will be in place before any other polls are opened in these grand Islands. Then do it now. Get it out of the way and lets move on to the big stuff.. We do not needs this interfering with discussion on other items.Then do it now. Get it out of the way and lets move on to the big stuff. We do not need this interfering with discussion on other items. I am somewhat surprised and dismayed to read your article "OMOV not a priority for CIG". This does not surprise me, however, since I have held the view for sometime that the Hon. Premier does not really support the concept notwithstanding your statement of his denial to the contrary. What is surprising to me is that he seems to be able to convince his PPM colleagues and the C4C members of his Government to defer this issue. They have obviously forgotten that OMOV was an integral part of their election campaign platform and, in my view, played no small part in their election at the polls. It cannot be denied that getting people back to work, the local economy and stabilising the Country are important issues but I feel that OMOV is likewise such an important issued for the Country that it should share top billing with those other issues. Given the time it will take to make the Legislative changes, make the necessary constituency adjustments and educate the voting public it is important that the Hon. Premier embark on this programme with minimum delay. With many legal and intelligent minds at his disposal this should not be difficult to achieve. Change the law but have the implementation for the election after because it will be too late to implement for the upcoming election. After all, it is all about getting re elected. They can say they kept their promise, but in a way that is favorable to them. I think this means it is not CURRENTLY a priority. With the way that the party system is ran here, OMOV is not beneficial to the politicians of the day as with the current standard you can ride into power on the coat tails of your fellow candidates. Having the OMOV would mean that you actually have to be elected on your personal merit and sorry to say that most of the candidates who are now in power would fail miserably. Some of you are saying that its ok to wait as election is 3 years away. Well look at that… close your eyes and open them and you will realise we were saying welcome to these new politicians just a few months ago and look how time has flown. Unfortunately if we wait until the last minute to formalize the OMOV we will be too late as it takes alot of logistics on this. Remember we have to re-establish boundaries, voters must be notified of what area they are now in. Voter ID's will have to be changed, an educational process must be implemented. This all cannot be done just 6 months before an election. If we do not do it now, we will see that this get swept under the rug and before elections the Premier will say its too late now "BUT WE PROMISE NEXT TIME"
With the unemployment now at its worst, with crime now getting on the increase, with people losing their homes and jobs and businesses at such an alarming rate, and the PPM not having done anything other than play cozy with the UK and kiss n make up, I am afraid Alden for you and your government THERE WONT BE A NEXT TIME!! I wish the economy was there priority, but the have already proven it is not as the have done nothing to lower the cost of doing business, encourage investment, or improve the unemployment situation. To the contrary, they rushed through the conservation bill which will stifle development. So which prospective West Bay OMOV constituency would be allocated for the Mac By-election? The current system favors political parties. Why would Alden be in a rush? How many UDP would have won in west bay and how many ppms would have won in GT and Bodden Town if we had OMOV? Not as many as in the current system. I could bet that independents like Bo Miller would have clinched an LA spot at the expense of one of the parties, most likely PPM. Think about it guys – OMOV means the end of straight party voting which is what continues to return a majority of one party in each constituency. My guess it is that it wont happen any time soon. What I see coming is the making or breaking of the new blood in the Government. Those who stood and spoke about what “I” would do if elected, are now forced to either (a) Grow a pair or (b) Prepare for new work in 2017. Remember the Bodden Town two and the George Town two. RIP. Be warned, dont be acting like eunch's when the bell rings. Apart from Marco Archer refinancing some debt, this government has done jack. And that had nothing to do with Marco and everything to do with changes in the capital markets. What happen to decreasing the duty on fuel when he got elected, funny how things change after the Campaign season ends. I guess that's why they call it the silly season, because anyone would be silly to believe anything these guys promise. "Meet the new boss. Same as the old boss." With over 65% of those who voted in the 2012 referendum supporting OMOV, the present Government ingores this substantial majority at its peril. As the previous Government found out. This Government could further distinguish itself from the previous one by acting swifty on implementing OMOV. When they do not. They appear no different. It may be a critical error. Unless the Premier is keeping this one in his back pocket in order to curry favor closer to election time. The rhythmic and predictable swings in public opinion generally tend to disapproval of the incumbants byt he end of a term and OMOV will be just the thing that the Premier can deliver prior to the next election or anytime that is most favorable to him. Do what you say or we will make you scramble come next election. OMOV will only be a fair voting process, not the candidates or platforms. If you voted for someone because they promised OMOV then you need to find something else to dwell on. Actually there is a word not being taken into consideration – Current. They will have to adress it shortly or pay for it in the next election. But we have also heard from others where we all want the PPM to deal with everything today. I take it that they have a plan as to when and how to deal with each of their promises. Alden is NATO – no action talk only. Always speaking/talking from the corner of his mouth. It is time to see some changes in the way funds/assistance is given to certain individuals through the CFS and start helping the indigenous Caymanians who genuinely need help. Deal with crime, and labour problems and stop painting that pretty picture of false words. I am an Caymanian and it is time the government address Crime and Labour issues. Stop the issuing of permits to people who don't have work for the people who they take out permits for and they end up on the street hunting down people to employ them. Cancel those permits and send them home. We are comply creating more crime in our homeland. What about the other "Campaign PROMISE" about reducing the duty of fuel so that CUC would not be killing every single person, business, and overall economy. It is time that the PPM steps up and make good on all of the promises. If they want to fix the economy that is the first place they should look. It effects us all. Stablize the country by making affordable to live here. Those of us who are fortunate to have a job all work to just pay CUC. You talking about the Fuel Duty that MCKEEVA raised once, no make that twice, Oh my Bad make that THREE TIMES!!!! Big, Big difference from blowing MILLIONS on failed "Private Financing" deals. DO NOT. I REPEAT CAYMAN, do NOT EVER, EVER, EVER FORGET the MESS MCKEEVA has put these Islands in. The Voting Process did not create the McKeeva dictatorship, how people were brainwashed to place their votes is what created his reign. OMOV will not matter if people are sucked back into McKeeva PR machine BS. What is the point of focusing on changing the voting system now when the NEXT ELECTION is over THREE YEARS AWAY!!!!! Good ol Ezzard wants to waste the Legislative Assembly's valueable time and like the Pied Piper the little rats want to follow along BLINDLY. Please, PLEASE focus on the important issues of the day. Fix was is IMPORTANT NOW!! If in two more years a law is not in place THEN judgers can judge and haters can hate!!!! The people spoke on this matter twice. Once at the referendum and once at the general election when the PPM was voted in in large part due to their commitment on OMOV. There is no reason to put it off, pass it now and win back the confidence and support of the people who voted for them or put it off and lose that support. Very simple. But the economy seems to take precedent. The Finance Minister, Marco Archer has saved us much expense. To implement the OMOV at this time may be costly and will put us back to where we was before in terms of economic development and jobs. At times, you may have to wait a little bit longer for democratic change. It is either upholding a fair democratic system or placing food on our tables. I prefer they focus on the latter one. Most of the work has been done. Pass it now so that there is plenty of time for things to be in place for the next election. Putting it off till the last minute makes it possible to claim there is not time to get it done. The arguments have been made twice once for the referendum and once in the general election. We do not need to debate it again they just have to keep their word. Either they can do it themselves or they can back Ezzard's bill, either way. But DO IT as promised. I'm choosing to give them the benefit of the doubt here. My immediate reaction was the same – yeh…saw this one coming…! But I thought about it and have to agree that they NEED to focus all resources on the immediate issues for which they campaigned. People cannot eat OMOV and OMOV doesn't pay the bills. They have 4 yrs – Let's focus on fixing the country and then in the last stretch we can look at ensuring that the elections are outfitted for OMOV. If their first order of business was OMOV, then the naysayers would be screaming foul at their priorities – people are unemployed, hungry and desperate. OMOV won't fix that folks. My exact sentiments. Going to one man one vote is not even really necessary. I prefer to have my 4 votes. All I think they should do eventually is inrease EE and NS to two votes per person. Why take away my votes. There are much more pressing issues right now and is only so much that can be done in any year. UDP is always harping on it but when the referendum was held they hijacked it and made it impossible to pass. All of you forgot that or what. I wonder why they are so gung-ho about it now. Have any of you asked that question? The probably want the constituencies chopped up so they can swoop in and take over specific areas like I saw happend in other islands. You all better be careful – you might bite off more than you can chew. Mr. Premier, you are correct- there is no rush. Didn't fool me though but alot more of your promises will be broken. Not being McKeeva might have got Alden elected Premier, but that is not enough to keep him there at the next election. Alden likes the perks of power too much and OMOV risks that. What perks does he like? Flying first class? Staying in ridiculously expensive hotels? Travelling with a huge entourage? Renting limousines? Charging ridiculous expenses on his credit card? Being chaffeur driven all day every day? Having servants, a chef and security on our dime? We know all of those and more were the perks demanded by McKeeva! AND we know that all of it was rejected by Alden! Clear conflct between your allegations and reality so dont be so pathetic. What a slap in the face for those that voted for them specifically because he promised that he would implement OMOV if he was elected. Alden is definitely showing his true colors. He say his top priorities were getting people back to work, the local economy and stabilizing the country. OK, so what has he done so far ? He didn’t even mention the Mount Trashmore so that obviously not a priority for the CIG. Of course it isnt a piority. Ppm have fooled the voters that voted for them, just like the udp id the tie before. We were also told that the first thing they would do if elected, was cut the duty on fuel so that the "majority" of us could afford to plug in our fridges, turn on a fan, and be able to put a few gallons of gas in our car so hat we could drive to work. With the so called budget surplus i see no reason why the duty on fuel cant be cut back and the 3.2% civil service pay cut be added back to their pay. The small businesses will have a chance if we see these measures put in place. Come ppm, please step and start delivering on yiur campaign promises. No timeframe for the legislation means it will not happen under the ppm. Premier McLaughlin and the government said whatever was necessary to get elected. The have the majority and can get it done but will not. How many more campaign promises will they break?